Helplessly pretty. The eMac, iBook, and iMac. I have recently gotten a hold of some legacy Apple products. Looking back at these machines really makes you realize how beautifully engineered and ahead of the competition they used to be. I'll be showing you the eMac, the iBook and the iMac - all of them are charming beyond belief. 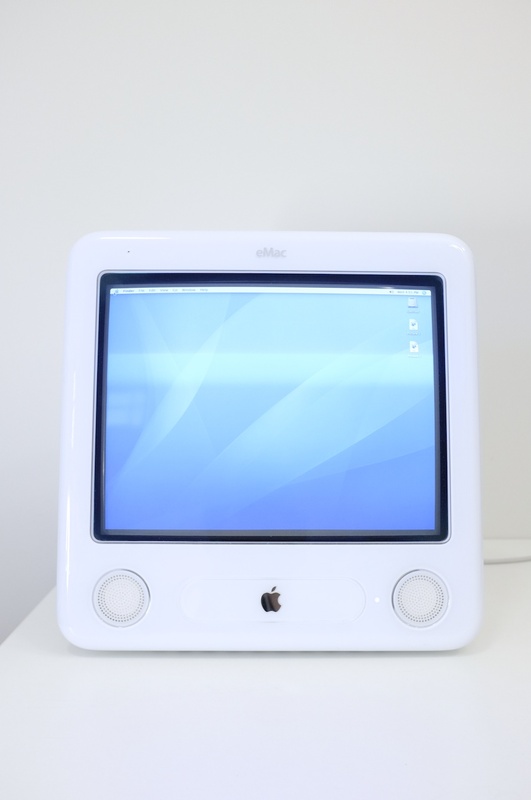 First launched in 2002, the eMac (Educational Mac) was designed for the educational market but was sold to the general public as an affordable alternative to the iMac. This machine has a special place in my heart because it is what I used in elementary school. I remember learning how to type, play games, write and make illustrations on this exact machine. And I remember running as quickly as possible to the few eMacs in the computer lab to avoid using an iMac G3 because I fell in love with the sleek, minimalist appearance. The eMac is the last Mac to use a CRT display. This makes the eMac particularly cool in my opinion - it is the most futuristic rendition ever produced of the very original iMac. In essence, they are the same computers. What has always impressed me is how simple the rear of the eMac is. The radial grills for the fans is the perfect intersection of function and form. it brings you to your knees. One thing I did notice as I powered it on is how loud computers used to be. Listen to my recording of my eMac vs the MacBook Pro. The eMac is like a blow dryer . The bottom. Removing the single screw by that plastic panel gives you access to the RAM. Port access. Everything is beautifully executed, particularly when you consider how PCs of the same age had no respect for details like what color connectors are. That power button feels out of place though, as it angles outwards in its neutral position. 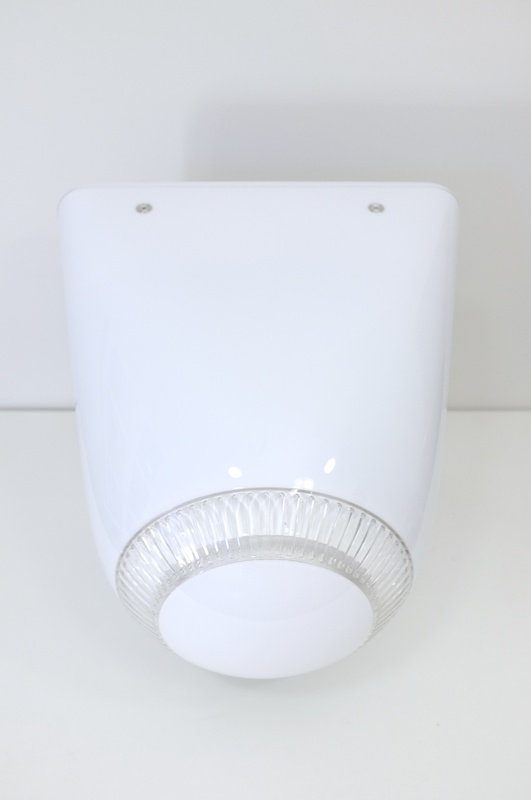 The eMac really is a display of how to properly execute a plastic product. It doesn’t pretend to be something else like so many companies do with plastic today. It was awesome in the days when there was more “mass” for designers to play around with. I think there’s something really fun about the intersection of components in areas like the photo above. There’s nothing attractive about a CD drive popping out. But because the eMac has so much character, even this simple action is amusing. This is a rare instance where I think the tray loading drive is better suited than a slot-load one. Next, we have the 14” iBook G4, launched in 2003. First impression is on how the laptop lacks rigidity. This is largely due to the fact that I’ve become so accustomed to unibody construction on my laptops. Nevertheless, the iBook still feels superior to many of the laptops they sell in stores like BestBuy today. Shows how advanced Apple’s hardware really was/is. 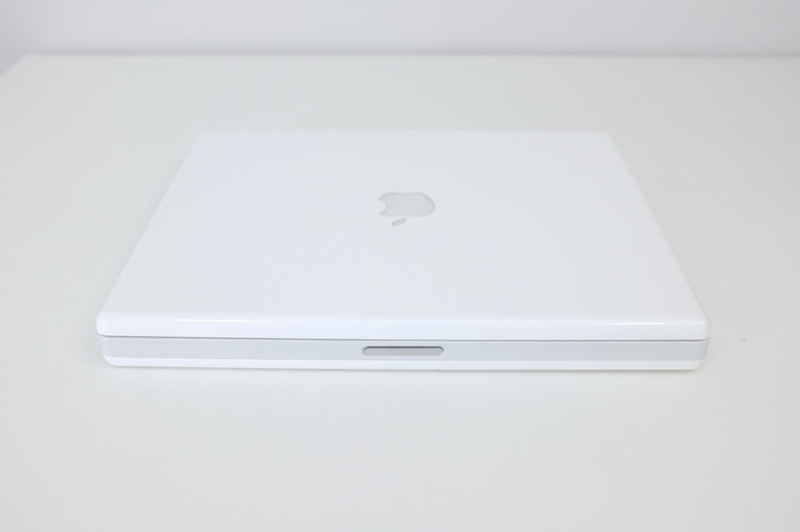 The iBook is substantially thicker than the non-retina MacBook Pro and has the pre-MagSafe connector. What you immediately notice as you open the hinge is how similar this is to the current day Macs. The iBook hinge seems to still be the best solution for a clamshell design. Of course, this was an age before the the magnetic closure system we have in Macs of today. The iBook uses a small latch that hides in the display until a magnet in the body of the Mac pulls it down. This little ceremony that happens everytime you close the lid. Nothing much to note other than the hilariously small trackpad and the cutout on the hinge. By the way, that keyboard started out as the same color as the chasis, but seems to have gotten discolored with time. I wonder if that cutout was placed for cooling needs. The bottom. Let me repeat, this laptop is from 2003. What computer in 2003 had a bottom this attractive? The portable Macs of this generation had a huge design flaw though - the feet fell off over time. I don’t think I’ve seen a single iBook or PowerBook with all four feet. The coin lock release is like a foreshadowing of the wireless keyboard and Magic trackpad of today. It's fun to see the introduction of aluminum details. We'll see even more in the next Mac. The iMac, launched in 2004. This is actually an Intel based Mac from 2006, but both models are fundamentally the same externally. Though there hasn’t been any foundational change to the design for 8 years now, the first generation iMac character has a unique charm to it. I remember how shocking this design was when I first saw it. It’s an incredibly simple rendition of the personal computer. The stand is genius too, and nobody has found a more elegant solution since then. Though the iMac wasn’t the first to have a slot-loading drive, this implementation feels so effortless. I do sometimes miss Apple’s white age. The designs of this age were so calm, warm and pure, despite the brutally honest and analytical design. I especially love the way the clear layer interacts with the opaque white inner shell. However all this glossy plastic did make Apple's products universally prone to scratches. The lineup of today stands the test of time much better. The bottom of the iMac has vent grills that are painted metal, something that’s rare in the Apple universe. I have a secret love for well executed paint on electronics - it reminds me of machines, tools and engines, in a good way. The rear. That iMac logo is really large and feels out of place. Good thing it's been replaced with the Apple logo now. Considered placement of ports. I currently use a cinema display and wish that my stand also had that plastic ring around the hole. The current stands have the hard edge of the aluminum touching the power cable and if you tilt your monitor a lot, it will actually begin shaving off material from the cable. By the way, the original PowerPC iMacs had the power button positioned by the I/O ports so that it was directly opposite to the status light on the front of the computer. Apple initially emphasized that the placement was picked purposefully so that the power button can be found without looking behind the display. 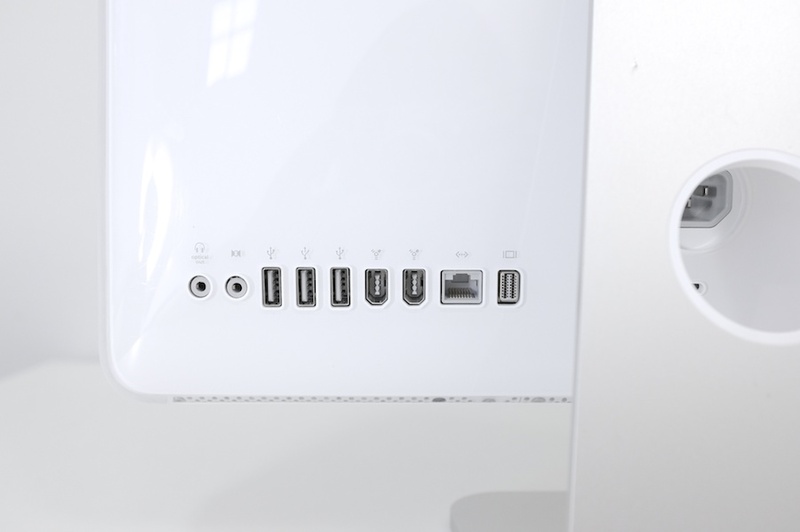 Later versions (including the current iMacs) have the power button on the opposite side from the ports. My guess is that some people accidentally shut off their machines while plugging in something.